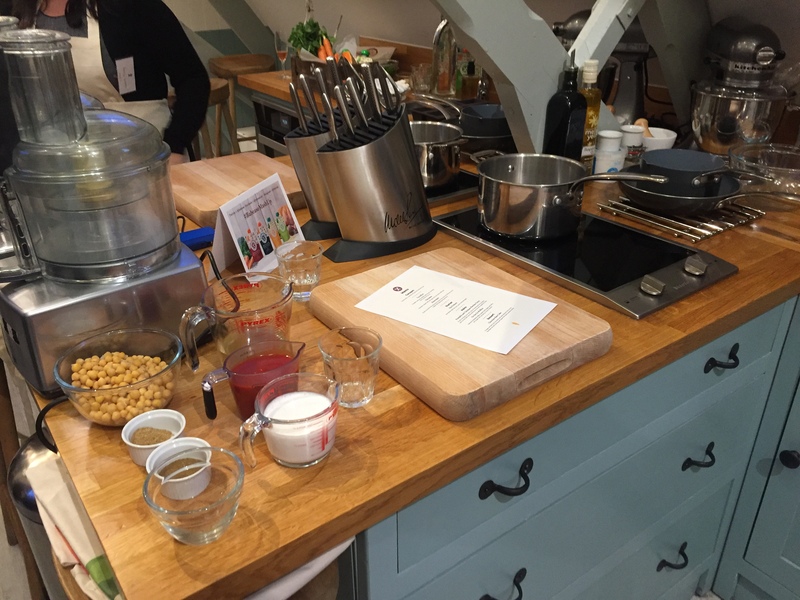 Last week I was invited to attend a Babease weaning cookery masterclass with fellow parent bloggers at the Cactus Kitchens in Clapham. This was exciting for many reasons! Firstly it was a night out! Win! Secondly, it was a chance to meet other parent bloggers. Thirdly, I hoped it would be a chance to get inspired in the kitchen again, which it definitely was! Lastly, I was looking forward to eating some yummy food. So before I tell you about my evening let’s talk about Babease. They’re a company which makes Food for babies, not baby food. Their organic food pouches contain (wherever possible) locally sourced ingredients which you would happily cook with in your kitchen, with the emphasis on using vegetables as first tastes rather than fruit fillers. I reviewed their range of pouches last month, so head over to find out more there. Back to the Babease weaning cookery masterclass. After listening to an introduction by the company’s founder, chef Tom Redwood, and watching him create the main course, we found a cooking station and a partner to create our dinner for the evening. 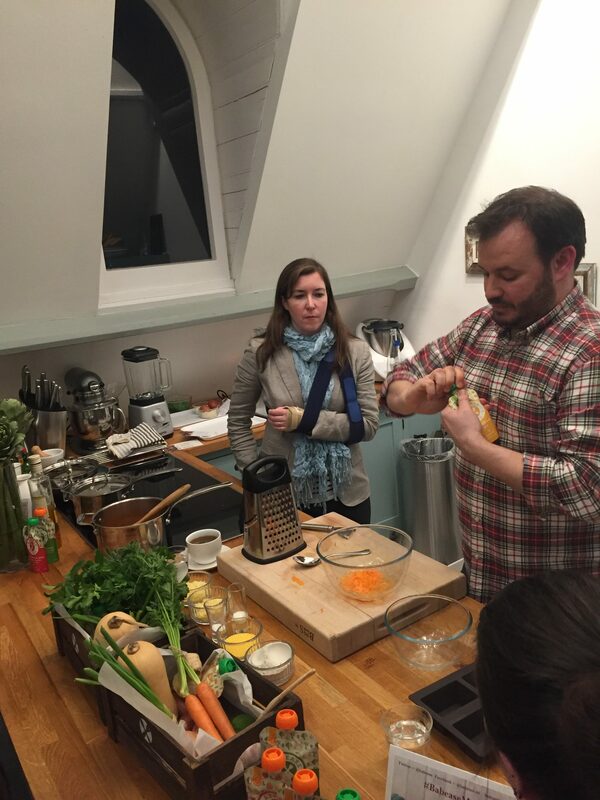 Babease Weaning cookery Masterclass – What did we cook? Throughout the evening we cooked three simple dishes under Tom’s instruction. A curry, savoury on the go muffins and pea fritters. All perfect for the whole family, all easy to make, and all using fresh healthy ingredients. 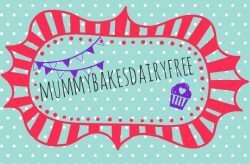 The recipes were all gluten free, nut free and soya free, and vegetarian. Those recipes that used dairy and eggs were easily adaptable. When I returned home I recreated the on the go muffins. This time I made them little one friendly. You can find the recipe for my version soon. What I loved about cooking the Babease recipes was how they felt so familiar. 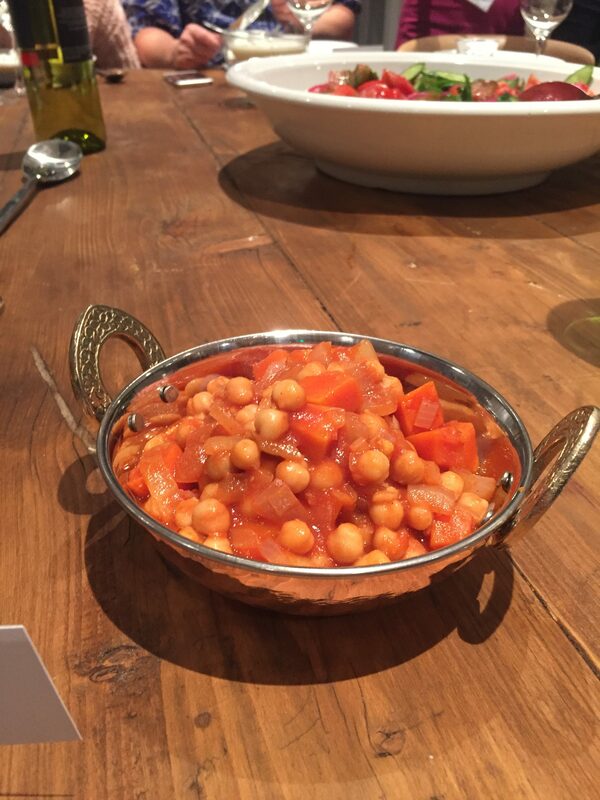 Especially the curry which is similar to my own Sweet Potato and Chickpea Curry . The ingredient choices made sense and are in keeping with the Babease ethos “Every ingredient used for a reason”. After we finished cooking our dinner we enjoyed eating altogether. It makes a change eating at a leisurely pace!! 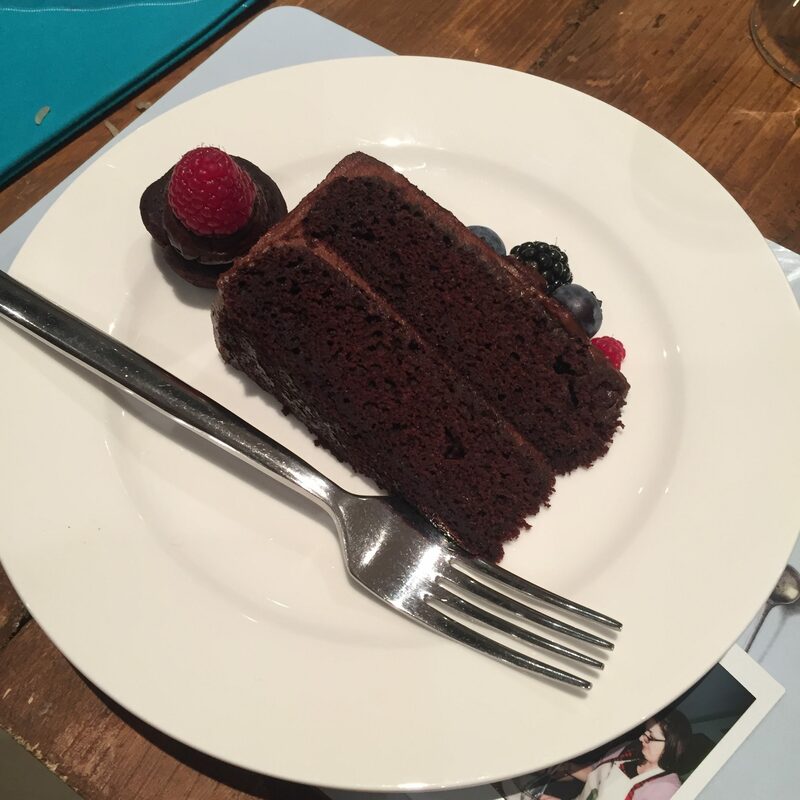 We were also treated to a slice of the delicious Chocolate Beetroot Cake with Avocado Frosting. It’s definitely one to put on the list to make at home! It was such an enjoyable evening cooking in the Cactus kitchens, not just because there was an amazing team who set out the ingredients, magic-ed away the dirty dishes, and tidied up for us as we went! I also got to meet and cook with the lovely Lucie from, Lucie Loves It. After a lovely evening, complete with a sneaky peak in the Saturday Kitchen studio, I enjoyed having a rummage through a brilliant goodie bag. Although I am pretty certain I will end up killing the kaffir lime plant, any hints on how to keep it alive? 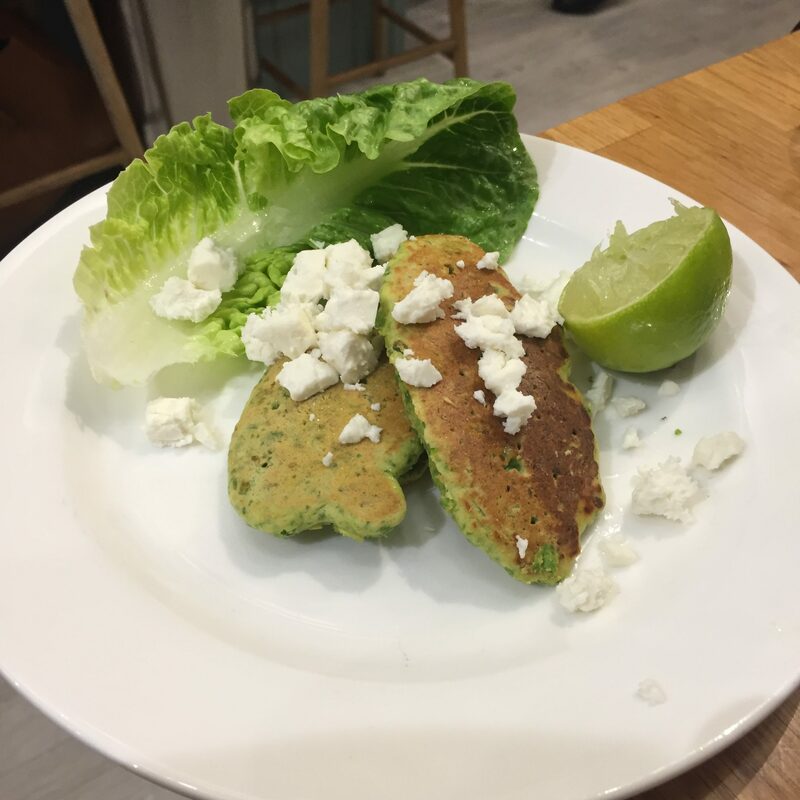 Previous Post Pancake Day Recipes – dairy, egg, nut & soya free.